As young newlyweds, Ron and Kathy Kazmar chose a quaint little farming town in which to put down their new roots. 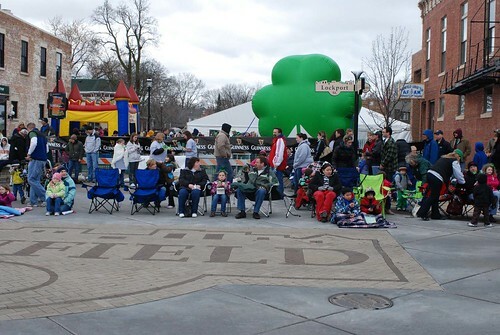 Surrounded by farm fields that for generations had provided food and local livelihood, Plainfield counted just 1,800 residents when the couple settled in the village in the early 1970s – young professionals with big dreams and a fondness for the close-knit hamlet nestled between better-known places called Joliet and Naperville. The community then was poised on the threshold of the myriad changes that come with progress and the passage of time. A fresh bachelor’s degree from Illinois State University in hand, Kathy had arrived in the fall of 1971, refining her educator chops as a student teacher at what was then called simply Plainfield High School. District 202 at that time numbered just one high school; one junior high, Indian Trail; and two elementary schools, Central and Crystal Lawns. A native of the Spring Valley, just west of Peru on the north bank of the Illinois River, Kathy remembers letting her family know where she’d landed her student teaching gig. “I said, ‘Dad, get out a map, look for Plainfield,’” she recalled one recent afternoon. “He said, ‘Oh my goodness, you’re going to Chicago!’” After student teaching and an ensuing semester on the faculty in Chaney-Monge School District 88 in Crest Hill, Kathy heard of an opening on the physical education teaching roster at PHS. She returned to the school she would end up calling home for 27 years, coaching track and field for 16 years and eventually serving for a decade as assistant athletic director. 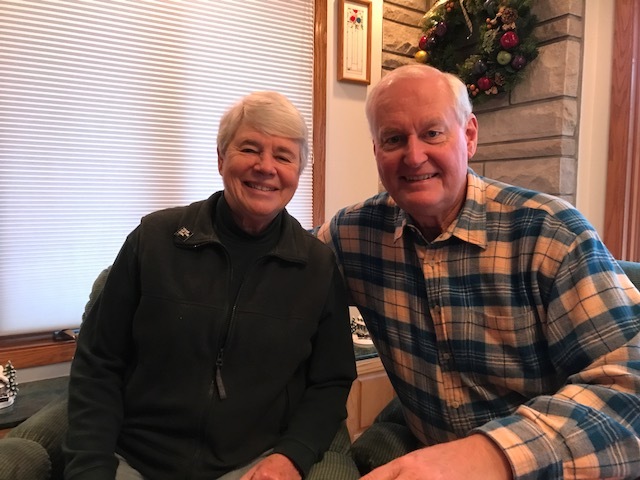 Undeterred but with help from her newfound friend, eventual longtime school board member Bess Eichelberger – who lived with the Kazmars after she was widowed in 1976, until she passed away nine years ago – Kathy began building the sports programs for girls anyway. At first there were no equipment or uniforms provided by the district. Kathy teamed up with Ed Eichelberger, Bess’ husband, to fashion training weights using empty detergent bottles and concrete. There were, Kathy said, lots of bake sales and car washes to help fill the early funding gaps. “Finally (the administration) realized that we were here to stay, so after four years we got girls’ sports,” she said. Ron launched his own considerable stretch of involvement with the local schools when, shortly into the second half of a 40-year career in financial accounting, he joined the board of education in 2001. He would serve for eight years, including a pair of two-year stints as its president. “During that time, we built 17 schools,” he said, noting that enrollment skyrocketed as the district’s population swelled in the building boom that transformed the region in the early 2000’s. After stepping down from the board, Ron continued to fill the position of board treasurer, a role he maintains today. He also was drawn into volunteerism beyond the school setting, today serving with Kathy as a greeter at Saint Mary Immaculate Parish and on boards affiliated with the Greater Joliet YMCA. The Plainfield presence of the regional agency, the C.W. Avery Family YMCA, has benefitted abundantly from the Giving Gala, an annual soiree founded by Kathy and Bess. Now coordinated with help from both Kazmars, who work out at the Avery facility several times each week, the yearly black-tie event will be held for its 11th and final time on Feb. 24 at Bolingbrook Golf Club. Ron said the festive evening draws 400 to 500 people every year and has raised more than $1.5 million for YMCA scholarships since it began. 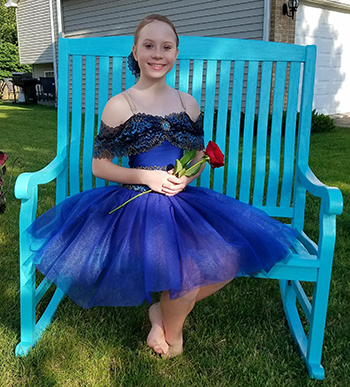 The spirit of volunteerism that makes the annual benefit a great success is a big part of what endears the Plainfield community to the couple. Ron said he has been pleased to see the town embrace the increasingly diverse population that has filled its neighborhoods and schools in recent years. “I think it’s grown, but it still has a small-town atmosphere,” he said. Kathy said she and her husband remain mindful of Bess Eichelberger’s words. “Three things she always said: ‘Work hard, play hard and give back to the community,’” she said, adding, “My community has embraced me. When I cut my arm, I bleed green.” The hue is, of course, appropriate for the pair’s upcoming role. 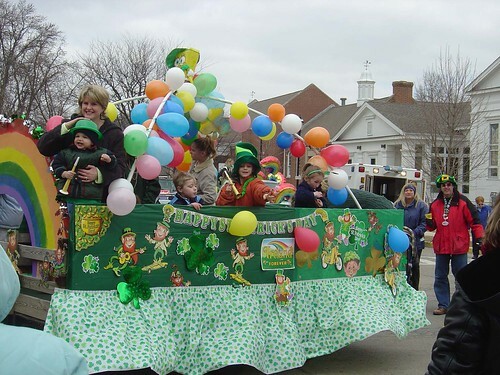 The Kazmars, who will ride in seats of honor as this year’s grand marshals, love a good parade. Kathy has had a significant hand in the big procession that draws so many visitors downtown when Homecoming rolls around each autumn. 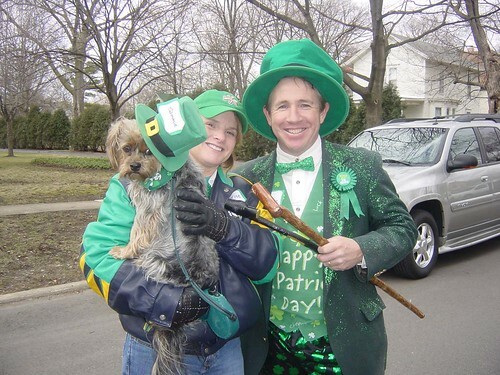 She said she and fellow Plainfield High School Central Campus supporters Jean Brannen and Ingrid Andreasen were tapped to help revive the parade when its numbers had begun to wane, shortly after Kathy’s retirement at the end of the 1998-99 school year. 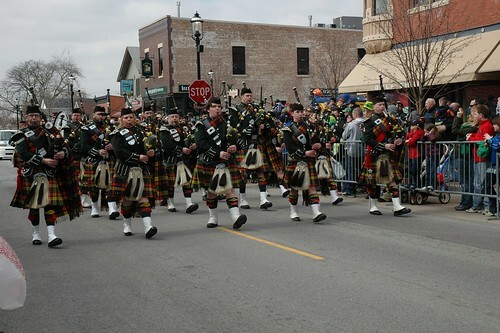 Now, with participation back up near levels seen in the beloved parade’s heyday, Kathy said she especially relishes seeing the beaming faces of parents and grandparents as they watch their kids make their way up Lockport Street in the midst of the processional throng. 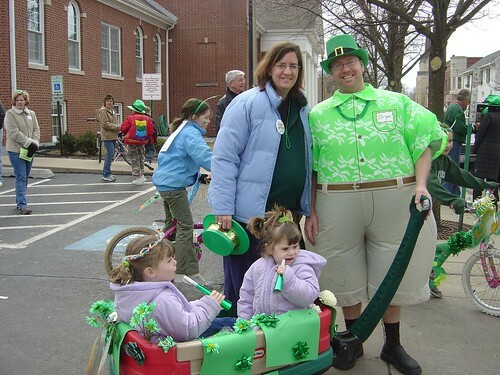 She and Ron both marvel at the yearly tradition, unheard of in most other communities. “Nobody can describe it, unless you’ve been there,” Kathy said. 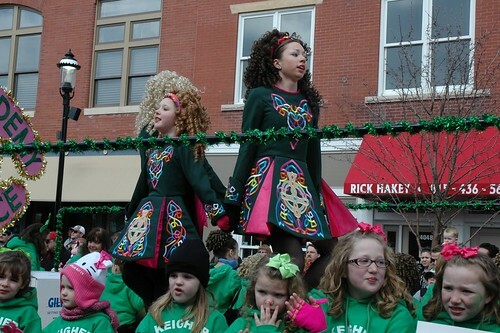 The Hometown Irish Parade has a similar effect, and the Kazmars are likely to be around for many more of the mid-March processions. They’ll be heading off to Scottsdale for a couple of weeks shortly after this year’s event, but they have no intention of relocating to warmer climes, as many other retirees do.